FEELING LUCKY? Fancy winning a prize? Every month we will be running a monthly prize draw on our Facebook page where you can win a variety of products and services from Bee Spotted. Entry will cost the relevant amount as stated on the graphic. To enter you will need to follow the 3 steps below to qualify. The winner will be drawn at random from the pot and announced on the 1st day of the following month (in this case December) by a Facebook live video. You can enter as many times as you wish but will need to pay the amount again. i.e. if you wish to enter 3 times this month you will need to pay £3. 20% of all profits each month will be donated to our chosen charity GOSH. I’m in… what do I need to do? 1. Pay your entry fee in either cash or via https://paypal.me/SharonBIZEE/1 This must be Friends & Family. Please ensure you state your full name in the NOTES on PayPal so we know exactly who to enter into the draw. 2. Share this Facebook post on your personal timeline and/or your business timeline. 3. Comment “I want to stand out from the crowd and #BeeSpotted” on the same post. 1. 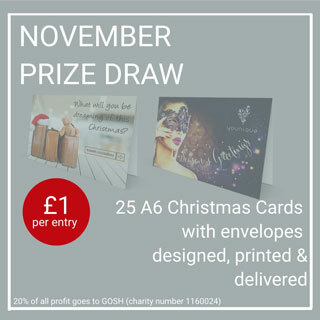 This month’s prize draw runs from 1st November 2018-30th November 2018. 2. All steps 1-2-3 must be completed to qualify. 3. Facebook is in no way affiliated with this draw.